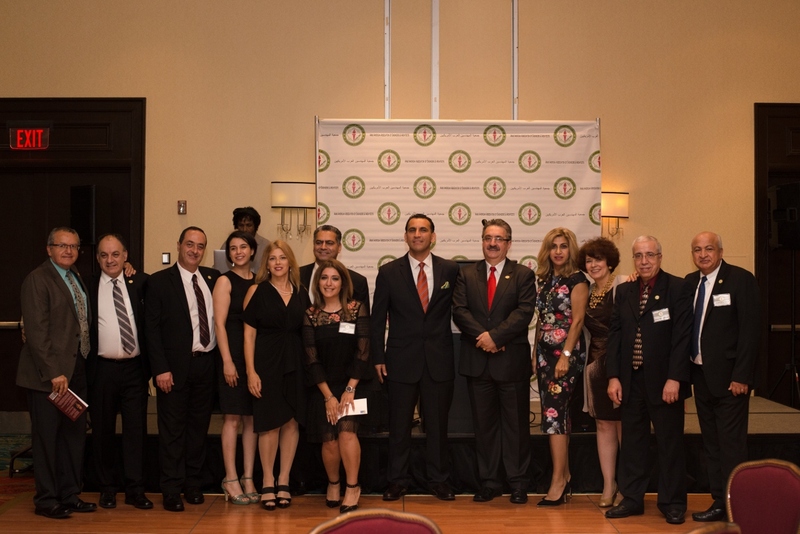 The Arab American Association of Engineers and Architects (AAAEA) - Capital Area Eighth Annual Gala held at the Washington Capital Beltway Marriott Hotel on Oct. 14 was a great success. Guests were greeted at the entrance to the hotel by members of our youth committee who were helping with the registration. Once inside, the supporters enjoyed one hour of networking while viewing beautiful art pieces presented by four talented artists, John Sproston, Thoria Hassan, Michele Foshee and Hana Pharoan. After parading into the dining room to the Arabic mix presented by Mr. Mauz Edriss, the guests were welcomed by the County Executive of Prince George's County, the Honorable Rushern L. Baker, III. Guests were enjoying their dinner, while Oud music was performed by Mr. Mauz. Dinner was followed by the guest speaker Mr. Rick Canizales, the Transportation Director for Prince William County. The evening program continued with honoring two individuals: Ms. Melek El Nimer, Founder of the Unite Lebanon Youth Project (ULYP). Ms. El Nimer received the AAAEA-DC Outstanding Humanitarian Award for her efforts through the ULYP organization to creating educational opportunities and giving equal access to quality educational programs to children, youth, and women in the marginalized communities. The second awardee was Dr. Ziad Sabra, for his outstanding efforts and commitment to the AAAEA-DC chapter by constantly showing great leadership and support to the organization. Students who received AAAEA-DC scholarship celebrated their awards with the gala guests who wished them success in their future endeavor. The gala festivities continued with raffles during the evening, and guests were roaring from laughter during the comedy standup performed by Mr. Amer Zahr. To conclude, the evening guests enjoyed a little swing on the dance floor to the energetic DJ music. AAAEA-DC would like to extend its thanks to the sponsors of the annual gala. Gold sponsors included ACell, United Energy Products, and Stantec. Silver Sponsors included Aegis, Dewberry, EBA, Geotechnical Solutions Inc., HAVTECH, NAI Michael, Terracon, and Sabra, Wang & Associates, Inc. Our Raffle sponsors included Advanced Thermal Solution, Design America Engineering, Inc., Armstrong International, Bay Associates Group, JMT, Johnson Controls Inc., Mc Namee Hosea, The Morin Company, LLC, WSP, Prime AE Group, RPSEG Keys Energy Center LLC, Shipley & Horne, P.A, Tanis Hotel, A.J. Adam Engineering, LLC and Dulles Geotechnical Engineering.